Sat., Sept. 1, 2018, 7 a.m. The $10.2 million Jayne Auld Manor, 2830 E. Francis Ave., will include a three-story main building and five, two-story duplexes. In all, there will be 25 two-bedroom units and 23 three-bedroom units. The complex also will have a community garden and play structure, and it will primarily be aimed at the workforce population earning less than 60 percent of the area’s median income. Spokane County’s median household income for a four-person house is about $65,000 a year. The development is being built on 1.8 acres of vacant land near Harmon-Shipley Park and Arlington Elementary School. The project is funded by the Washington Housing Trust Fund and the Washington State Housing Finance Commission, as well as through a forgivable loan of $320,000 from the U.S. Department of Housing and Urban Development and a $388,850 Community Development Block Grant, also from HUD, which was used to help buy the land. It also qualifies for the city’s Multi-Family Tax Exemption. The complex is named after Jayne Auld, the organization’s former executive director who died in 2016. Groundbreaking is expected in early 2019, and the complex will be completed in March 2020. 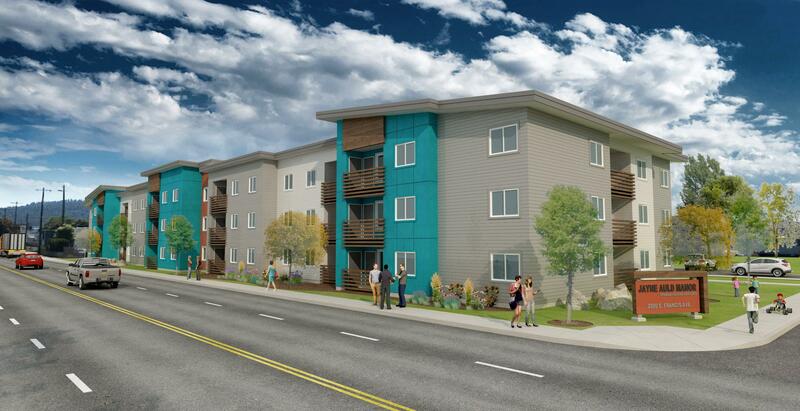 Spokane Housing Ventures was founded in 1992, and currently owns and operates 1,300 units of affordable rental units in ten Washington counties. The project was designed by ZBA Architecture, of Spokane. Published: Sept. 1, 2018, 7 a.m.